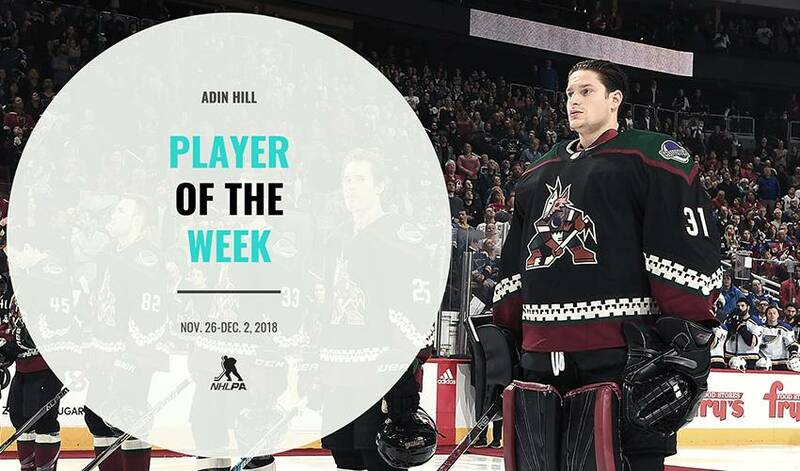 It was trial by fire for Adin Hill, who was called to action mid-game Tuesday night by the Arizona Coyotes in the wake of lower-body injuries to Antti Raanta and Darcy Kuemper. Hill responded with three straight wins and his first NHL career shutout while leading all netminders with a .938 save percentage and 0.43 goals-against average. The Comox, B.C. native also penciled himself into the Coyotes record book as the youngest goalie since the team relocated to Arizona in 1996 to earn a shutout while setting the record for longest shutout streak by a netminder to begin a season. 🔘 Led all @NHL goalies for the week with a .983 SV% and 0.43 GAA. 🔘 Became the youngest goalie in #Coyotes history to earn a shutout. 🔘 Set the franchise record for the longest shutout streak by a goaltender to begin a season. Hill stepped in for an injured Antti Raanta Tuesday night at Xcel Energy Center with the Coyotes down 3-1 in the third period. The 22-year-old made five saves in relief to help back his team to a 4-3 come-from-behind victory over the Minnesota Wild with Josh Archibald scoring the game-winner for Arizona. Coyotes head coach Rick Tocchet liked what he saw from his team as they ended a four-game losing streak with a three-goal third period. "I like the resiliency. A couple guys were struggling early and we kind of regained ourselves in the third, so that's nice. [Raanta] goes down so we have some adversity, [Hill's] got to go in net, call him up from the minors, maybe we can rally around this stuff." Tocchet's sentiments seemingly carried into the rest of the week. With both Raanta and Kuemper sidelined, Thursday night marked Hill's first start of the season when the Coyotes hit the road for Music City. Hill turned aside all 29 shots he faced from the Nashville Predators to earn the first shutout of his NHL career in a 3-0 win. "It was exciting finding out I was starting here in Nashville," Hill said to reporters postgame. "Electric crowd here, a great hockey city. The team had a wonderful game. It was awesome. We all dedicated ourselves to the game." Hill did his fair share when opportunity came knocking for the Predators, but was quick to credit his teammates for the support he felt in front. "The [defensemen] did a good job boxing guys out, clearing pucks when we had to, and the penalty kill did an outstanding job. It was an exciting game, an exciting win." The Coyotes returned home to Gila River Arena Saturday, where Hill made 25 saves in his second start of the week for a 6-1 win over the visiting St. Louis Blues. A second-period tally by Robert Thomas of the Blues stood as the only goal Hill allowed all week as he earned the game's third star and third win of the week. "To come in and give us that calmness he's provided when other teams had chances, he's done a tremendous job both games he's started," Christian Fischer praised Hill postgame. The Coyotes hit the road for Los Angeles for a Tuesday night matchup against the Kings at Staples Center (10:30 p.m. ET).